Dr. Sumita Arora MBBS, MD (Obstetrician & Gynaecology) is the leading Gynecologist and Obstetrician of the hospital. She has specialized in Gynecological Laparoscopic Surgery and in High Risk Obstetrics. One of the 1st surgeon in the city of Lucknow to start Laparoscopic surgery for Gynecological diseases. Dr Sumita Arora has performed more than 1000 difficult surgical procedures laparoscopically. Her goal is to make the surgery more friendly and minimally invasive so that the return of the patient to normal becomes fast and smooth. She is practicing Obstetrician & Gynaecology for more than 20 years. Dr. Sumita Arora is a graduate as well as Post graduate from King George Medical College, Lucknow. She had a Post graduation - Masters in Gynaecology and Obstetrics, from same hospital. She is the leading Obstetrician & Gynecologist of the hospital with special interest in Laparoscopic Gynae. surgeries, High risk Obstetrics & Gynaecology & infertility. She has a vast experience of performing all types of Laparoscopic surgeries like Laparoscopic Hysterectomy, Laparoscopic Myomectomy, Laparoscopic ovarian cystectomy, Laparoscopic treatment of ectopic pregnancy, Laparoscopic salpingectomy, Endometriosis, Fertility enhancing laparoscopic surgeries. She is well experienced hysteroscopic surgeon and performs all types of hysteroscopic surgeries like hysteroscopic removal of endometrial polyp, synaechea, Septum ,Fibroid etc. She has received training in Laparoscopy & Hysteroscopic surgeries from India and Abroad. She has a vast experience of teaching post graduates and DNB students. 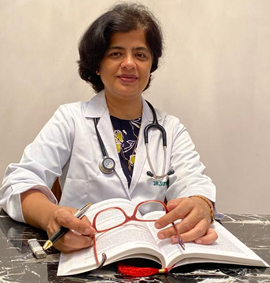 In past she has been consultant Obstetrician & Gynecologist at Apollo Hospital, Ludhiana and presently she is consultant Gynaecology and Laparoscopic surgeon at Vivekananda Hospital, Lucknow. Formerly she was HEAD OF THE DEPARTMENT OF OBSTETRICS AND GYNAECOLOGY at Vivekananda Polyclinic and Institute of Medical Sciences, Lucknow. She has established Laparoscopic Surgery in the Gynaecology Department. Now she is Obstetrician and gynaecologist at Aastha Maternity and Laparoscopy centre and developed it as the super speciality hospital with all latest facilities and equipements to make surgery safe and successful. Received Distinction in Opthalmics and Orthopaedic in April 1995. Awarded Diploma in Emergency Obstetric care by the Society of Obstetrics and Gynaecology of Canada (SOGC) at the ALARM International Programme in Feb.2004. Received many awards for Paper Presentaion in National Conferences. Organized many workshop & training programs for spreading knowledge.